As every patient is suffering from the problem in a different way, some might be having a problem in excess and for some, the problem might have just started. So, the age-related factor is very important because the patient might be very young so he/she might face the problem after some time. No doubt, the doctor give their best to treat the problem in the best way possible so that it does not happen again. Can I use any other medication with a hair transplant? In most cases, the doctor advised the patient to take Finasteride or Minoxidil. Both these medicines are very helpful in reversing the problem of hair loss. What is the procedure of the surgery? Before the hair transplant surgery, the patient is given anesthesia so that he/she does not feel any type of pain. During the hair transplant, the hair is taken from the back of the scalp and then they are transplanted where hair growth is very less. What are the methods of performing the surgery? There are tow methods FUE and FUT. In Follicular unit extraction, the hair follicles are taken one by one and the grafts are transplanted one by one where hair growth is very less. In this, the scaring is very minimal, so the recovery process is faster. In Follicular Unit Transplantation, a strip of hair is taken from the back of the scalp and it is transplanted where hair growth is very less. After the surgery, there will be a linear scar on the scalp which is noticeable. What is the time duration of the surgery? 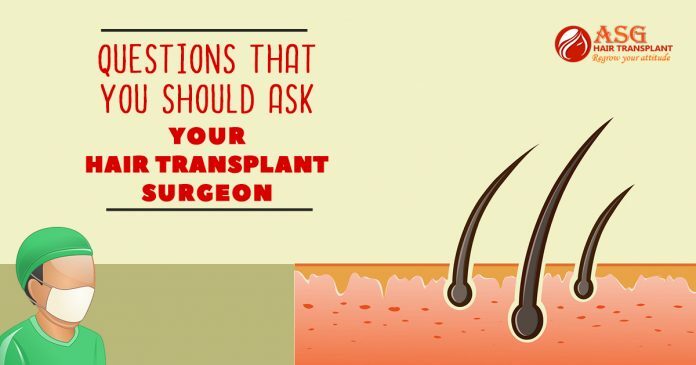 This depends on how much area needs transplantation. Generally, it takes around 4 to 8 hours to complete the entire procedure of transplantation. How many grafts are required? On average, 2500 to 300 grafts are required. The surgeon will first evaluate your hair and how much area is bald or where hair growth is very less. In case, if the bald area is more than the grafts requirement will be more. How much time does it take to see hair growth? This depends on whether you are following the doctor prescription or not. In most cases, hair growth is seen within 3 months. You have to keep in mind all the things which your doctor advises you to. Previous articleHow To Know Your Suitability For Hair Transplant?